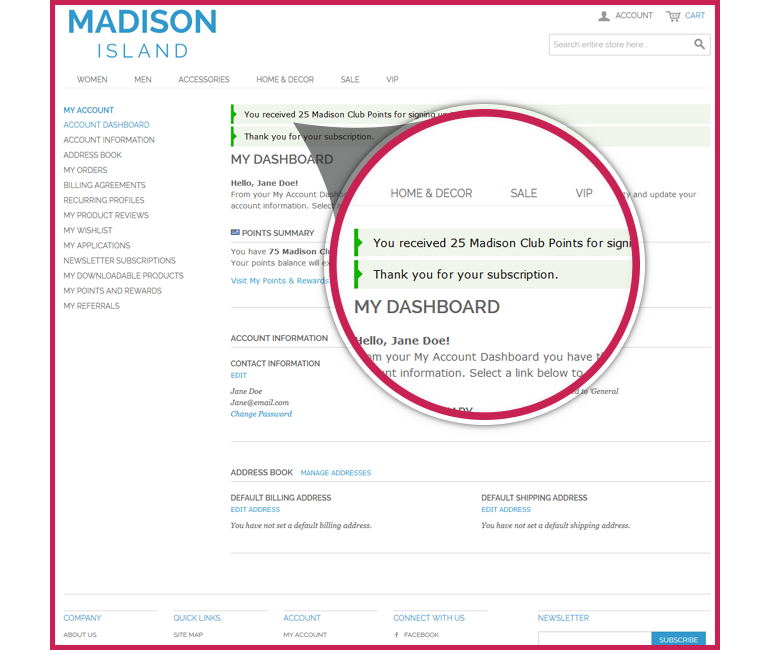 Your customers can be rewarded for signing up to your newsletter on the frontend. This reward is reliant on a rule being created to give the customer points on successful sign up to the website’s newsletter. To set this rule up you will need to access your Magento backend - Rewards > Reward Rules > Earning Rules > Customer Behaviour and setup the appropriate earning rule to trigger the reward. Here is a list of email newsletter systems that MageRewards works with. If your customer was to unsubscribe and then resubscribe they cannot earn the a new set of points again. The points for a newsletter subscription works off a one time only reward. In order for the customer to be rewarded they must sign up through the Magento newsletter subscription system. If you are using a third party system this must create the subscriber within Magento first before exporting it outside Magento’s database. This is so that MageRewards’s reward rules can be triggered and your customer is rewarded for their newsletter signup. Without the customer first being signed up within Magento’s system for the newsletter, MageRewards can’t reward the customer for their signup.